Light sea ice has been replaced by dark ocean water. Light snow has given way to dark ground. The Arctic’s changing color palette is a sign of the harrowing changes under way. I went to the Arctic for the first time in the summer of 2003 on the research vessel Nathaniel B. Palmer. I was a first-year graduate student then and the 45-day cruise was an eye-opening introduction to a place that I could not have imagined while growing up on the Gulf coast of Texas. It was the beginning of a period that has been as transformative for me as it has been for the Arctic itself. In the short length of time since I embarked on that trip, less than two decades, the Arctic has gone from being a scientific backwater to playing a prominent role in U.S. national security, cultural survival, human health, and economic development. I am fortunate to have had a front-row seat to this change, including a six-year stint living in Fairbanks, Alaska, which lies less than 150 miles from the Arctic Circle. The most striking thing that I have witnessed while working in the Arctic is the transition of nearly every surface from light to dark for at least part of the year. Light sea ice has been replaced by dark ocean water, light snow has given way to dark ground, and light glaciers have been supplanted by dark rocks. It is as if someone paved over a pristine surface with asphalt, turning it into the parking lot of a suburban shopping mall. The consequences could be far-reaching for every American, from Fairbanks to Key West. It is as if someone paved over a pristine surface with asphalt, turning it into the parking lot of a suburban shopping mall. In 2003, the year of that first trip, the Arctic was on the brink of an environmental transition so extensive that scientists, policymakers, and the people who knew it from generations of ancestors were caught by surprise. In September 2007, the satellites that monitor Arctic sea ice, glaciers, and snow cover reported that the summer minimum sea-ice extent was the lowest it had been since 1979, when observations were first made. That was the beginning of what would be a stunning series of record or near-record lows in the Arctic, culminating in the lowest sea-ice extent ever measured during the summer of 2012. The most recent data is just as startling: the average sea-ice extent in June of this year was 350,000 square miles smaller than the long-term historical average. That represents a loss of sea ice larger than Louisiana and my home state of Texas combined. The loss of summer sea ice is one of the most apparent signs of how the Arctic landscape is fundamentally changing. When I was on the Palmer, we were working in the Chukchi Sea, just north of Alaska, when we became trapped behind a sea-ice ridge that was so thick that we could not break through for several days. I spent those days out on the deck, taking pictures of the glistening white expanse of ice that stretched all the way to the North Pole. In 2012, I was back in nearly the exact same spot on exactly the same day. 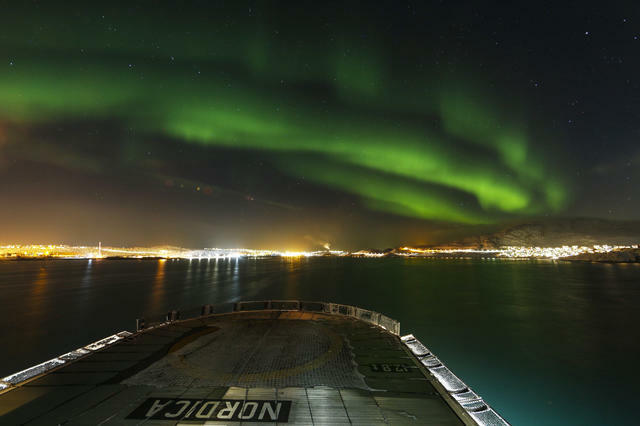 This time, there was nothing but dark, gray water as far as we could see – much to the disappointment of the many graduate students onboard who were making their own first trip to the Arctic. They never had the chance to see a single piece of ice during the six-week cruise. While sea ice is disappearing from the Arctic ice pack, big changes are also happening on land, as glaciers erode and the Greenland ice sheet shows its own signs of what could be catastrophic changes. Unlike the melting of sea ice, every drop of water that runs off the Greenland ice sheet contributes to a rise in sea levels around the world. The onset of surface melting on the Greenland ice sheet last year was the second earliest (after 2012) ever recorded over the 37 years of tracking. I flew over the ice sheet during the summer of 2012 and was stunned by the dark blue rivers cutting across the white landscape that were carrying new meltwater towards the Atlantic Ocean. 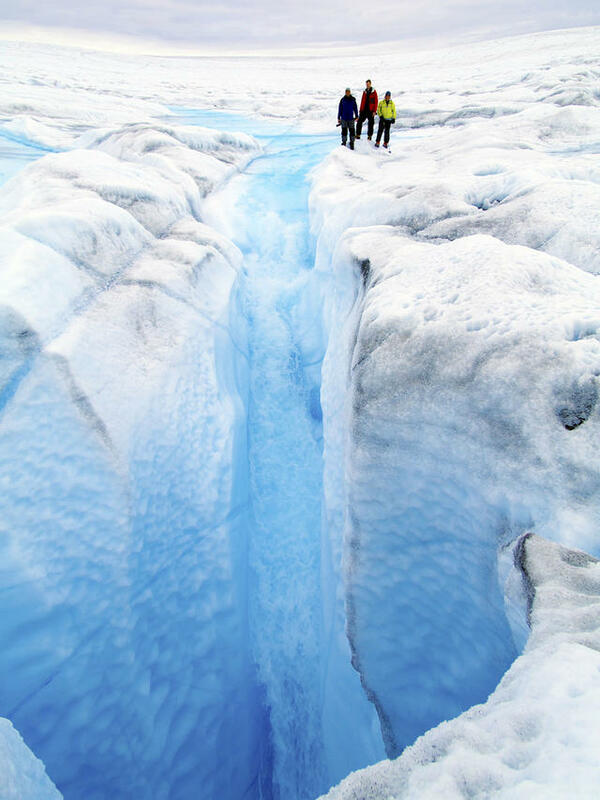 When the meltwater reaches the bed of a glacier, it acts as lubricant, causing the ice to slide more quickly into the open water. As a result, larger volumes are now calving from outlet glaciers, like Greenland’s massive Jakobshavn Glacier. Additionally, the large ice shelves extending into the ocean are melting from beneath, as the ocean waters warm. As these ice shelves lose strength and fragment, they no longer hold back the connected land ice. Since my first trip to the Arctic, the Greenland ice sheet has lost more than 3,000 gigatons of ice. That’s enough water to fill the entire Chesapeake Bay – 50 times. What Do You Think of Muir? If even 25 percent of the remaining ice stored in the Greenland ice sheet were to melt, it would raise sea levels by about 6 feet. My graduate school in Miami and my high school in Orange, Texas would both be under water. In fact, with eight of the 10 largest cities in the world situated near a coast, rising sea levels are a global problem that already affects a substantial portion of the population. Rising seas will continue to inundate low-lying areas and cause large storms to extend their damage further inland, as Superstorm Sandy did in 2012. 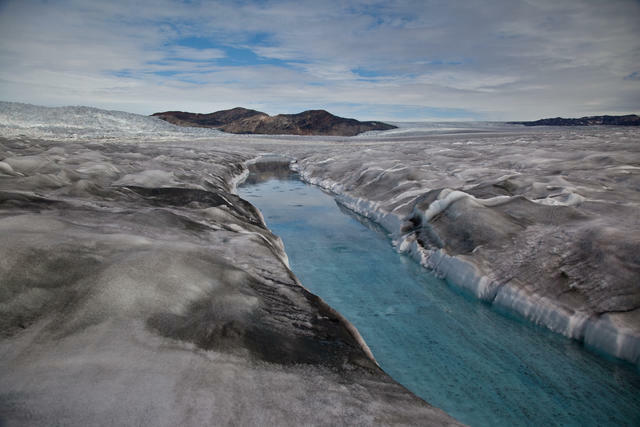 Since my first trip to the Arctic, the Greenland ice sheet has lost more than 3,000 gigatons of ice. That’s enough water to fill the entire Chesapeake Bay – 50 times. 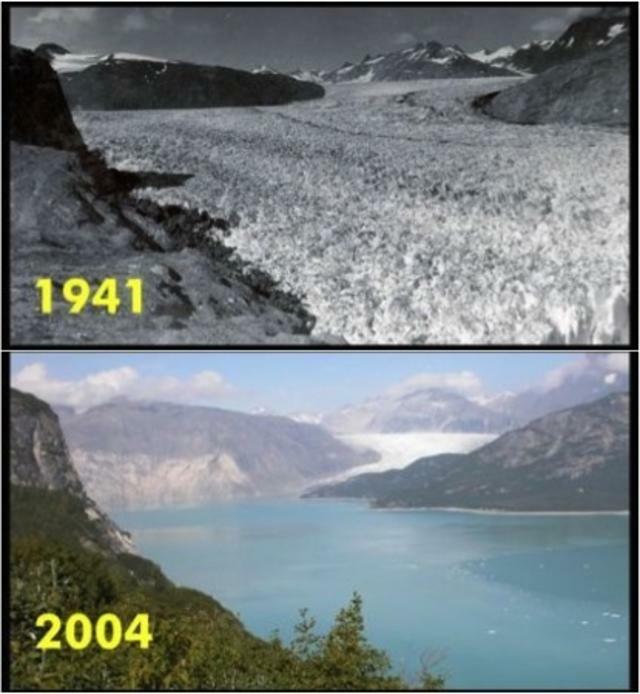 In Alaska, as well as the rest of the Arctic, alpine and tidewater glaciers are also receding at an unprecedented rate. In my career, I’ve conducted several studies in the state’s Glacier Bay National Park, and the changes I’ve seen are nothing short of extraordinary. On my first trip there in 2007, the park ranger who was my guide told me that he would take us to see Muir Glacier. He handed me a photo from 1941 of a towering mass that was more than 300 feet high and nearly three miles wide. After a one-hour boat ride, the ranger stopped in front of a picturesque beach flanked by hills and covered in spruce trees. Then he asked me what I thought of Muir Glacier. It had retreated more than 30 miles into the mountains, leaving behind a legacy of millions of gallons of ocean water. The disappearance of Muir Glacier is not unique. Hundreds of other glaciers throughout Alaska are undergoing similar transformations. 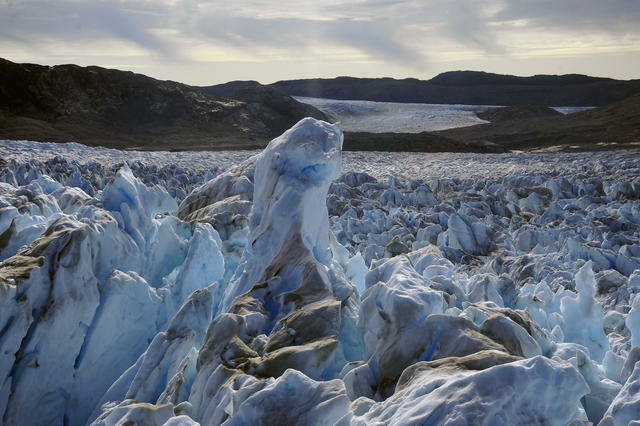 Some of my colleagues from the University of Alaska and the U.S. Geological Survey have estimated that Alaska is losing glacial ice at the rate of 75 billion metric tons annually. This melting produces enough water to cover the entire state, the biggest in the country, with nearly a foot of water every seven years. While the severity and impact of all this melting ice cannot be overstated, glacial retreat is also affecting the way water flows across the North American continent. In spring 2016, a period of intense melting of the Kaskawulsh Glacier in western Canada resulted in a redirection of water from the Kluane River, causing it to dry up in four days. Due to the loss of glacial mass, the meltwater now flows south instead of north, emptying into the Gulf of Alaska rather than the Bering Sea. The Kluane River had previously supplied the Yukon River, an important artery for transportation, and the loss of this water will have profound consequences for towns, villages, and ecosystems. It is the equivalent of the Ohio River no longer flowing into the Mississippi. It’s hard to imagine, but in some places, it’s reality. Like the glaciers, snow cover throughout the Arctic is declining sharply, especially in late spring. In 2016, record-low snow cover extents for the North American Arctic were reported in April and May, with snow-cover extent in the latter month falling below 1.5 million square miles for the first time in the satellite era. While the snow loss may be a big disappointment for cross-country skiers, the overall effect on the environment is not nearly so trivial. The lack of highly reflective snow exposes the dark soil to sunlight, causing it to warm quickly and thaw a layer of perennially frozen ground called permafrost. The thawing of permafrost has two major consequences, one local and the other very, very global. In interior and northern Alaska, most of the infrastructure – including roads, pipelines, runways, and buildings – is built on permafrost, which is a great substrate when frozen. I tried to dig through a layer of it in my backyard in Fairbanks to plant some trees, but gave up after hours of trying to penetrate the concrete-like soil with a pickaxe. When the permafrost thaws, however, the ground subsides, as the ice turns to water and drains away. This can destabilize everything that is built on top of it, causing roads to buckle and homes to sink into the ground. It is the equivalent of the Ohio River no longer flowing into the Mississippi. It’s hard to imagine, but in some places, it’s reality. While the destabilization and destruction of infrastructure in Alaska could cost billions of dollars, that is not the primary concern when it comes to permafrost. The real problem lies hidden in the soil itself. Permafrost contains millions of tons of rich, organic matter that has been frozen for centuries. Because the soil has been frozen, there has not been any decomposition of that matter, as would occur anywhere else. Once the soil thaws, though, the rotting process begins. Organic matter is turned into carbon dioxide and methane, which are released into the atmosphere, further exacerbating warming. This release of greenhouse gases from Arctic soils has the potential to fundamentally change the chemical composition of the atmosphere. In fact, it could dwarf the current human emissions of carbon dioxide that are already heating the planet. The transition from a light Arctic to a dark Arctic is being driven by unparalleled increases in temperatures, but it is that very change which also causes the region to warm at more than twice the global average. The concept is simple: light surfaces reflect the sun’s energy back into space, while dark surfaces absorb it. The more the sea ice melts, the more heat the dark Arctic Ocean absorbs, which, in turn, then causes more sea ice to melt. On land, the more the ice and snow melt, the more dark ground is exposed, which stores the heat that leads to more melting of snow and ice. This process, called “Arctic amplification,” will make the region a fundamentally different place within a few decades. Arctic amplification has already caused huge temperature anomalies across the region. The average surface air temperature for 2016 was by far the highest since 1900, and new record-high monthly temperatures were recorded for January, February, October, November, and December last year. In large parts of the Arctic – over Alaska, the North Pole, and northern Siberia – average annual temperatures in 2016 were more than 11 degrees Fahrenheit above the historical average. If the same were true in Chicago, Los Angeles, or Washington, it would make the headlines of every media outlet. There are simply no adjectives or analogies that can put this kind of temperature increase into context. While the warming observed in 2016 had been building for several years, it also went one harrowing step further. Previously, there had been record summer sea-ice minimums and summer temperature records had been broken, but conditions reverted to normal in winter. What changed last year was that the warming persisted into the winter months. Satellite observations showed that on March 7, 2017, Arctic sea ice reached an all-time, record-low winter maximum extent. Temperatures around the Arctic have remained above normal, impeding the accumulation of snow and ice on land Band preventing permafrost from refreezing. We can now see that something significant happened in the Arctic in 2012. The system, as a whole, appears to have hit a tipping point that year, and signs have worsened ever since. For most Americans, these rapid environmental changes may seem to be a world away, but the remoteness is only geographic. Indeed, the Arctic works as a refrigerator for our entire planet, helping to stabilize global climate and regulate temperatures. The boundary between the cold air over the Arctic and the warm air over the rest of us is what creates the jet stream, the powerful air current that is responsible for most of the weather we experience. Because the Arctic is warming twice as fast as other parts of the Northern Hemisphere, the temperature gradient is starting to dissipate, causing the jet stream to meander in unpredictable ways. Scientists such as Jennifer Francis of Rutgers University have shown that warming in the Arctic can destabilize weather patterns, in all likelihood contributing to severe heat waves, droughts, and harsh winter storms throughout the northern half of the globe, where 88 percent of the world’s population lives. Whether you are a farmer in Iowa or a real estate developer in Florida, these changes will affect you. 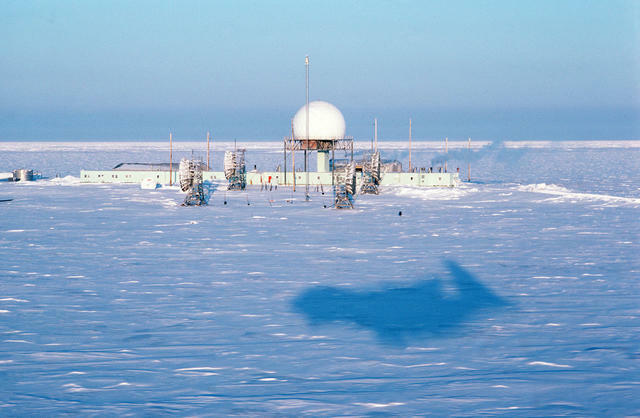 Up until the early 2000s, the Arctic played a niche role in U.S. science and domestic policy. Times have changed, and the country’s approach must change accordingly. The extent to which we are able to capitalize on emergent opportunities and deal with increasingly severe scenarios rests largely on our ability to effectively monitor the changes taking place. Through the sustained collection of environmental intelligence, we can generate actionable information to improve sea-ice- and weather-forecasting, as well as quantify sea-level rises and other changes in Arctic ecosystems. In other words, we can monitor indicators that have a direct bearing on our national interests, from food security to physical safety. This information has to come from a variety of sources, including satellites, new unmanned vehicles, ships, and, most importantly, native Arctic communities that can provide on-the-ground insights into how their environment is changing. Whether you are a farmer in Iowa or a real estate developer in Florida, these changes will affect you. There is not a moment to spare to improve our understanding of these dynamic conditions. Recent models by scientists such as James Overland have shown that even if global temperatures are held to an average increase of two degrees Celsius (3.6 degrees Fahrenheit), the Arctic will warm by more than five degrees Celsius (9 degrees Fahrenheit) by 2100. Warming temperatures and the loss of sea ice are already posing major challenges for Arctic residents, as migration patterns of subsistence food sources change and coastal erosion threatens to wash villages such as Shishmaref, Alaska into the ocean. The 560 Americans that call Shishmaref home will be some of the first U.S. climate refugees. They won’t likely be the last. Last year, for the first time, more than 1,000 passengers sailed on a cruise ship from Anchorage to New York through waters once choked with ice. That is a far cry from my first trip to the Arctic, only 15 years ago. Regardless of any mitigation efforts we take to reduce global temperature-increases in the coming decades, the Arctic is going to continue to fundamentally change. What will not change is the fact that what happens in the Arctic doesn’t stay in the Arctic. I hope that the new adventure-seekers who travel inside the Arctic Circle appreciate the transformation that has already occurred. After surveying a landscape that is far darker than it was just a few years ago, I hope they will return home with a better understanding of the need for a rapid deployment of resources to a region that has been ignored for far too long. Jeremy T. Mathis (@JeremyTMathis) is the director of the Arctic Research Program at the U.S. National Oceanic and Atmospheric Administration (NOAA). He holds a PhD in marine chemistry and is an affiliate professor at the Institute of Marine Science, University of Alaska Fairbanks. The opinions expressed are those of the author and do not necessarily reflect the views of NOAA or the Department of Commerce.